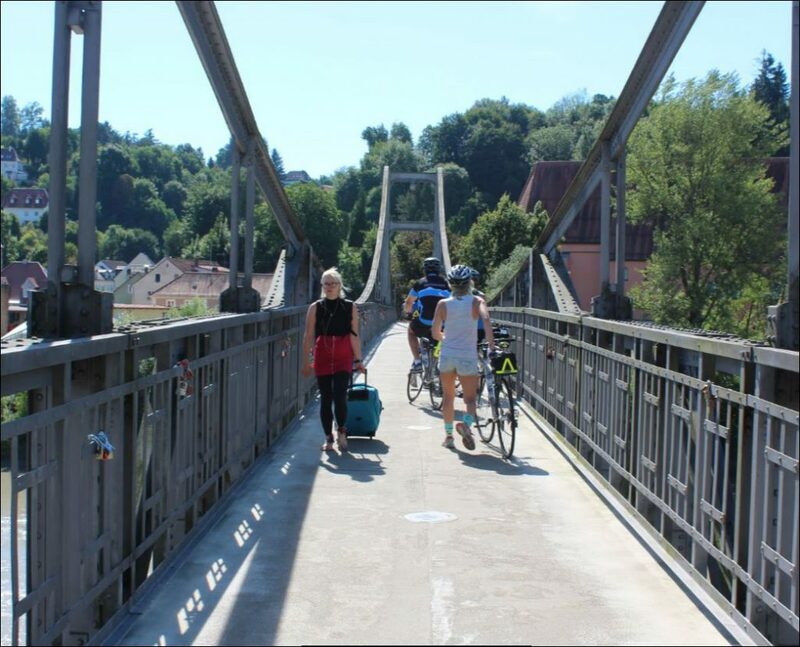 Passau, Germany — (Day 7 of Backroads/AMAWaterways biking/cruise) — Hard or really hard—that was our choice for our final day of cycling—today in Bavaria. “This is what you’ve been training for all week!” says our always enthusiastic Backroads leader Evan Thomson. We’ve been on the AmaWaterways AmaStella for a week sailing up the Danube from Budapest to Vilshofen, Germany, through Bratislava in Slovakia, Vienna, Durnstein, Melk and Linz, cycling through small towns, vineyards, orchards, past farms and fields, on small and larger roads and today, up a lot of hills. 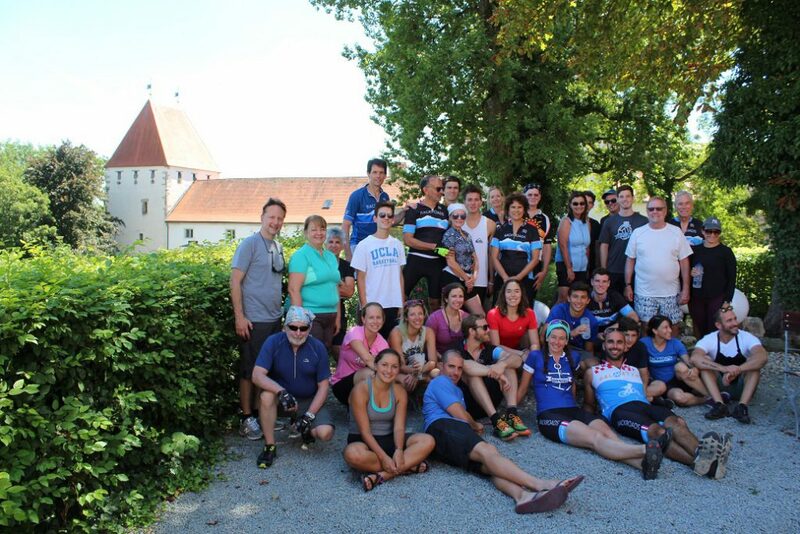 We cycled in 100-degree heat, pouring rain and spectacular blue-sky weather. Like six others, including the 14 year old who is the youngest on this “Breakaway” trip for families with older teens and young adult children, I’ve opted for an E Bike—You still have to pedal but it gives you a much appreciated assist on the hills. “A game changer,” one of the moms told me when I was debating whether to switch bikes. She was right. I love it! I’m not scared of the hills anymore! My husband, one of the oldest (at 68) in our group of 30, impresses all of us with his stamina on his “regular” bike. “Next time I’m going to get an E-bike,” said Matt Bronfman, here with his wife and three kids—including Micah, 14, the youngest rider with us, who opined he was having a lot more fun once he got his E-Bike. “I want to be able to enjoy the ride and not be working so hard on those hills,” he said. And there were lots of steep hills on today’s ride as we cycled from Passau—a beautiful baroque city of some 50,000-people surrounded by the Danube and Vils rivers—to Neuberg Castle and back to Vilshofen where the ship awaits. There are mostly hilly roads—lots of ups and downs. The countryside is beautiful, with farms, horses, pumpkin patches. We can see the Alps in the distance, and the Danube at various point along the way. 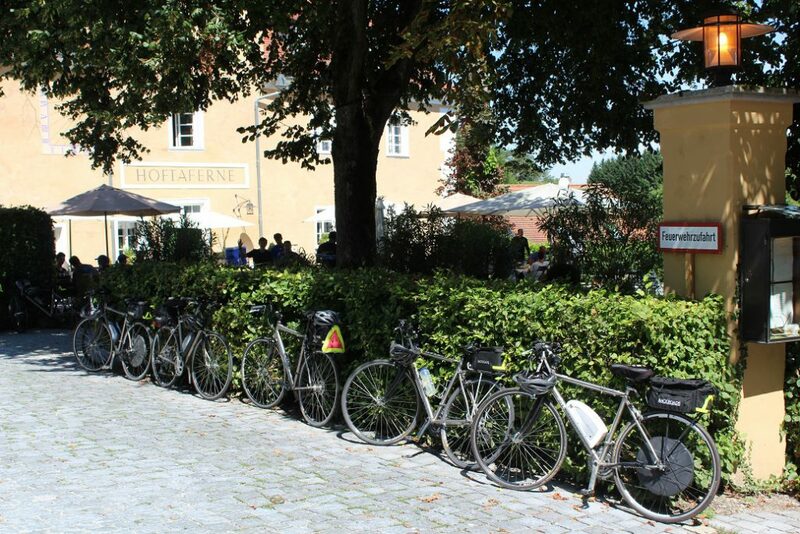 We stop for lunch at the Hoftaferne Neuberg, overlooking the castle that dates back to medieval days. When Count Palatine Otto Henry began his rule here in 1522, he decided to redesign the castle to a Renaissance palace—it became one of the most important palaces of the first half of the 16th Century in Germany. We don’t go inside but admire the gardens and the huge castle that looks exactly what a castle should be—red roof and all. AmaWaterways has a full roster of excursions—everything from “gentle tours” with little walking to active hikes and bike rides. The Backroads experience is far more active and takes us farther afield, like to this restaurant and the countryside. Most such trips, whether cycling, hiking or multi sport, require a change of hotels every two days. That is the beauty of the AmaStella being our floating hotel—they even stopped to pick up after one ride—and we have time to do laundry, relax, check in with family at home (there is plenty of WiFI). There are other pluses to such trips, besides all the active activities and the chance to get off the tourist track, those in our group explain. Of course many of the twenty-somethings and my daughter Reggie Foldes and son in law Dan Foldes, both 31, liked the challenge of the hills, even opting for a route with even more climbing. “We get competitive on the flats,” said Mark Sikand, 20, here with his parents and slightly younger brother. He and his brother Owen also said they’d recommend such trips to their friends. “It’s better to have other people to be with rather than just my family,” Mark said. As we finished our 35-miler on our last day, we arrived tired but happy – and looking forward to a Backroads farewell “Oktoberfest in August” beer party tonight before dinner.